Inverted Roof Water Tanks – Water Storage Tanks, Inc. The most common CorGal tanks are available with inverted or funnel type roof systems. 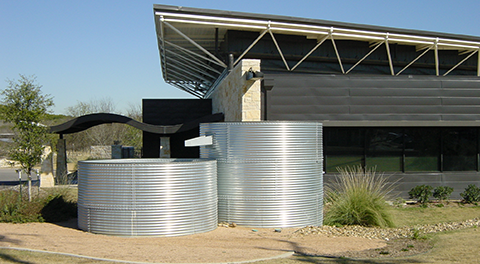 These tanks are often used to capture rain that falls directly onto the tank roof or to contain water that may be directed to the tank from a gutter, downspout or other water conductor pipe. A safety structure and debris filter is installed at the low point of the inverted roof CorGal tank. The safety structure will prevent a small child from falling into the tank. The debris filter will keep leaves, trash and animals from entering the water storage area of the tank. The inverted roof consists of multiple galvanized steel roof panels that are bolted together with a flat seam. 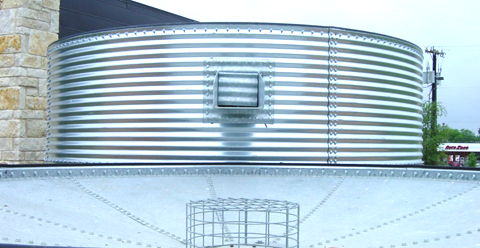 Looking for a larger diameter water storage tank with an inverted roof?